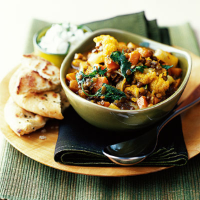 This gently-spiced vegetarian dhal combines a ready-made curry paste with lentils and vegetables. Excellent comfort food for a cold winter's evening. Put the onion and curry paste into a large flameproof casserole with a lid. Cook over a low heat, stirring continuously, for 3-4 minutes. Add the sweet potato and cardamom seeds and continue to cook for a further 3-4 minutes. Add the lentils and stock to the casserole and bring to the boil, cover and simmer for 15 minutes. Remove the lid and add the cauliflower. Bring back to the boil and simmer for a further 8-10 minutes or until the sweet potato and lentils are both tender and the stock has been absorbed. Stir in the coriander and season to taste. Serve with a dollop of natural yogurt and a Waitrose Indian bread such as Peshwari Naan, available from the grocery section. To prepare ahead, cook the dhal to the end of paragraph 2, then cool and chill. To serve, bring back to the boil and add the cauliflower and coriander. For a creamier version, replace half the stock with a 400ml can of coconut milk.